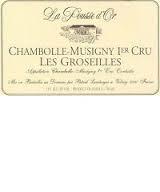 2012 Pousse d Or Chambolle Musigny Groseilles - $119.00: Vins Rare, The finest selection of rare wines. Burghound Rating: 92 Sweet Spot Outstanding! While the expressive nose is not quite as complex as that of the Feusselottes, it is even more complex with its pretty array of spicy black currant, floral and sandalwood scents. This is also quite restrained in the mouth with strikingly well-detailed medium weight flavors that possess the same fine depth as telegraphed by the nose, all wrapped in a balanced and firmly structured finish. This beauty should amply reward 10 to 12 years of cellar time. Burghound 92 Sweet Spot Outstanding!